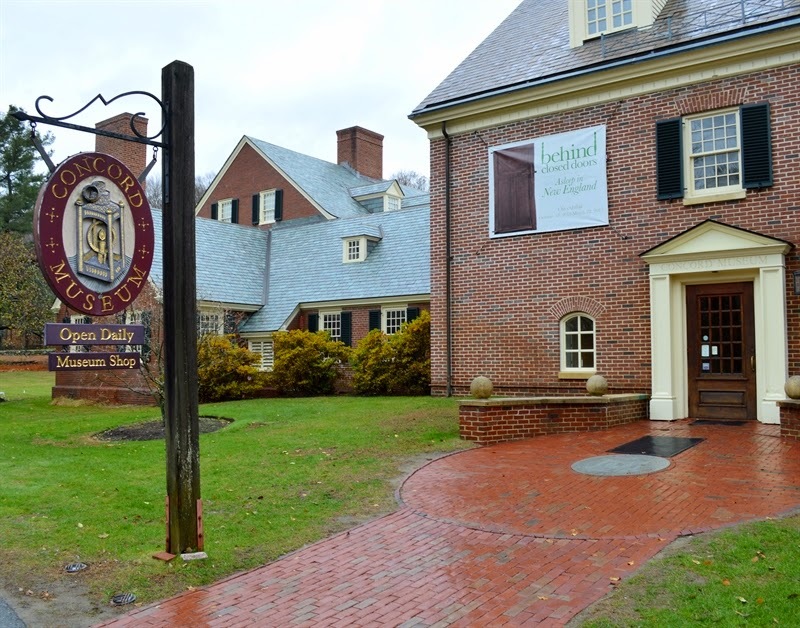 It's time for the "Family Trees" exhibit at the Concord Museum. Every year, our local museum has an exhibit of Christmas trees that are decorated by volunteers. The decorations are inspired by children's books. Over the years I have decorated quite a few trees. For the past three years I have decorated a wreath in a small hallway. You can see last year's wreath based on the book The Matchbox Diary HERE, the wreath from two years ago based on Wynken, Blynken and Nod HERE, and the tree I decorated with my neighbor three years ago based on the book Dear Mermaid HERE. 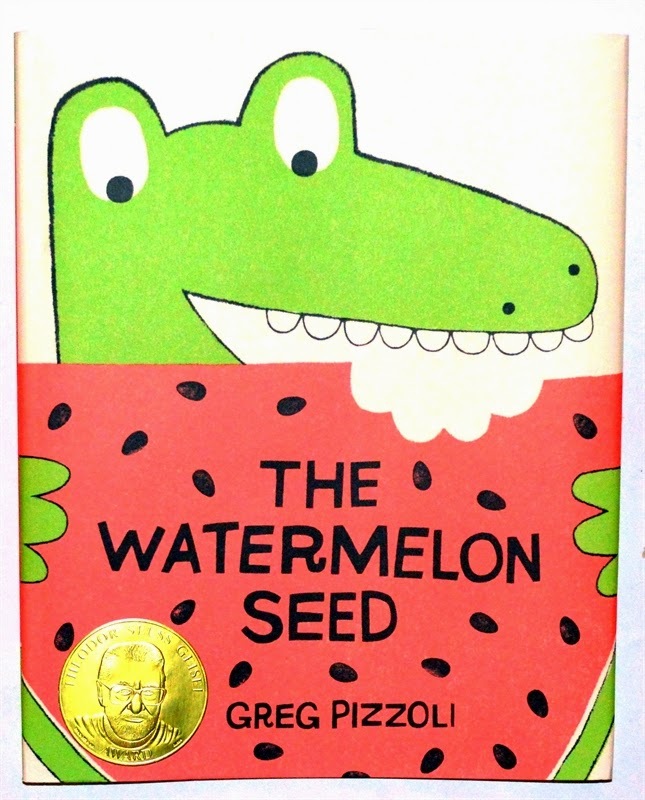 The book for this year's wreath was "the Watermelon Seed" by Greg Pizzoli. 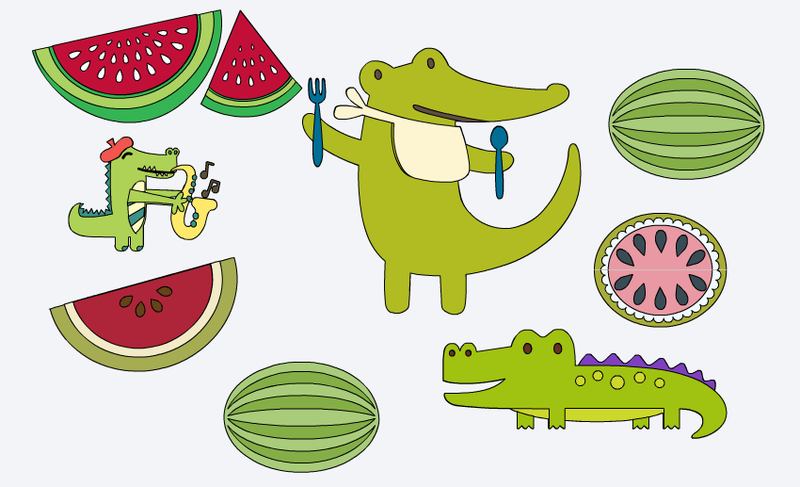 It is a very cute and simple story about a crocodile who loves watermelon. He has loved watermelon ever since he was a baby crocodile. When he accidentally swallows a seed, he panics thinking that a watermelon might grow inside him! Then he burps and the seed comes out. He says with relief that he'll never eat watermelon again...well...maybe just one slice! 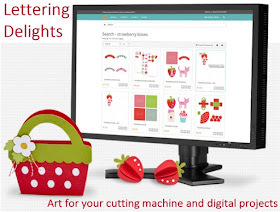 One of the features I like about Cricut Design Space is the search function which helps you locate images from many different image sets and preview them in full color. 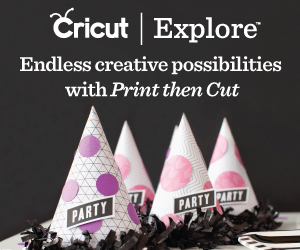 I didn't end up using a crocodile from the Cricut images but I was able to find some watermelons, wedges, and slices that suited my project. 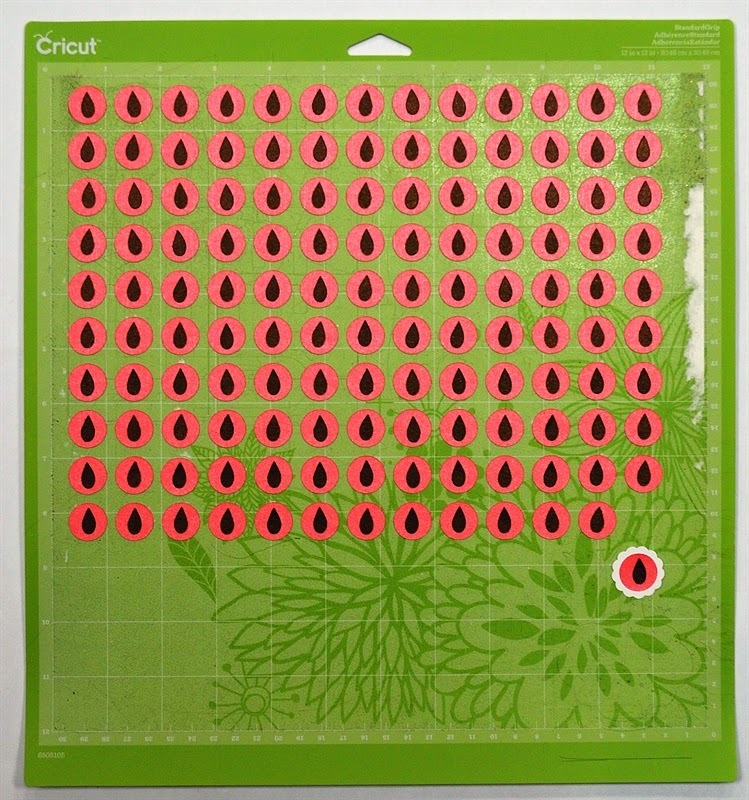 I also found some perfectly shaped watermelon seeds on the watermelon bag topper from the "Bag Toppers - Summer" digital set. I cut quite a few seeds from a shimmery brown cardstock. 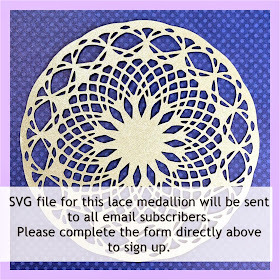 I also cut 130 small circles from watermelon pink pearl cardstock. I wanted to use papers that would catch some light from the overhead fixture in the hallway. I kept the circles on the mat while I added a watermelon seed to each circle. This made it much easier to keep track of all of the tiny pieces. 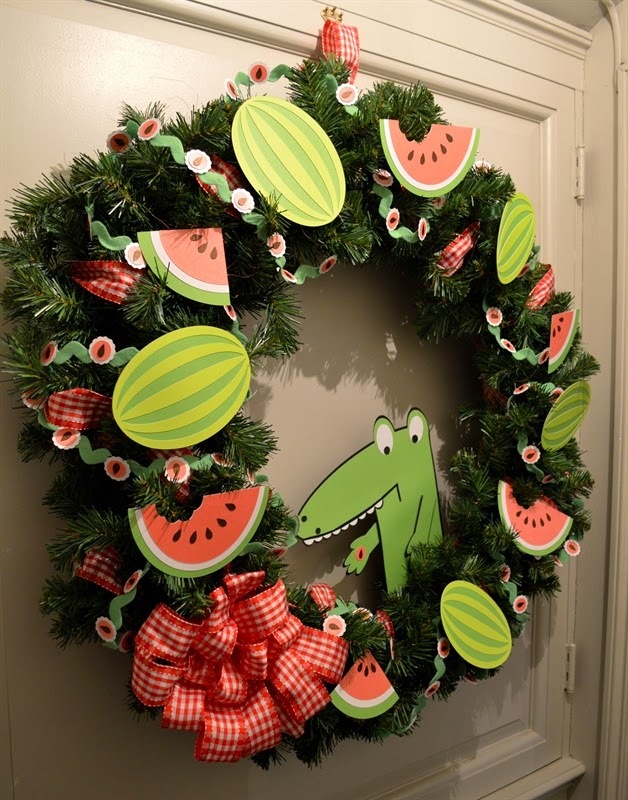 To accent the watermelon circles and make them stand out better on the green wreath, I punched white scalloped circles. 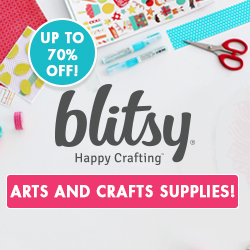 You never know when some craft supplies in your stash will find the perfect project. I found this oversized rick-rack in a discount store four or five years ago. It turned out to coordinate nicely with the color used in the book. It was exciting to finally have a good use for it! 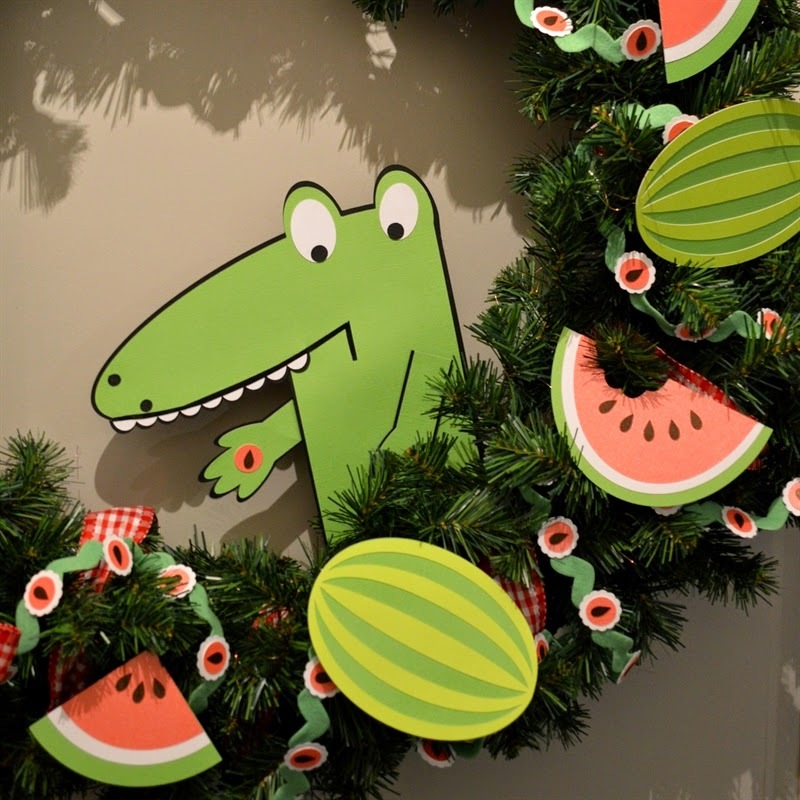 To be sure that the watermelon seed circles would stay attached to the garland for the duration of the exhibit, I stapled the white scalloped circles to the rick-rack and then used ScorTape to attach the watermelon seed circles them. I used my Tim Holtz tiny attacher stapler since the staples are small and easily hidden. Since watermelons are generally a summer treat, I used some red gingham ribbon that reminds me of picnic tablecloths to make a bow for the wreath. 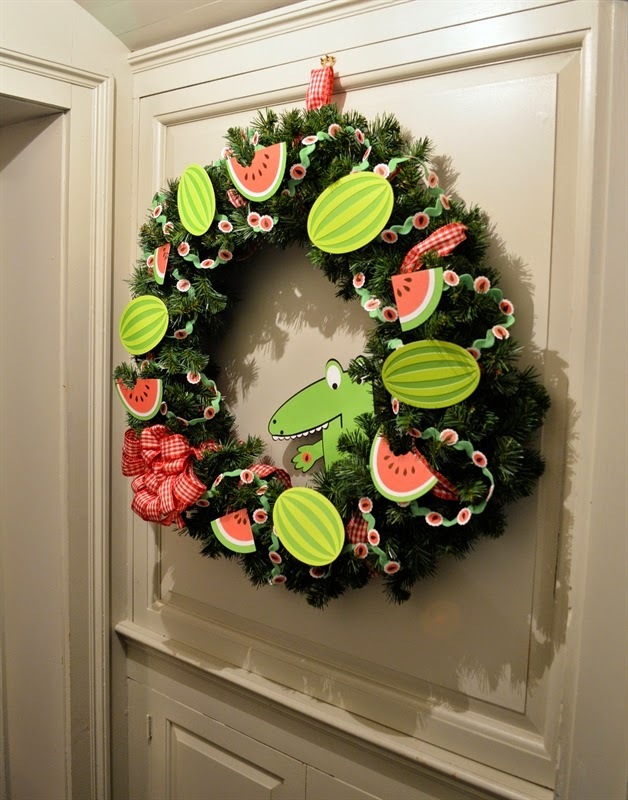 I also wound the ribbon through the wreath, along with the watermelon seed garland. If you'd like to see how I make big fluffy bows like this, there is a blog post from last year HERE and I also did a Snapguide with the step by step photos and directions HERE. I cut five full watermelons and alternated them with slices and wedges of watermelon - with more seeds! 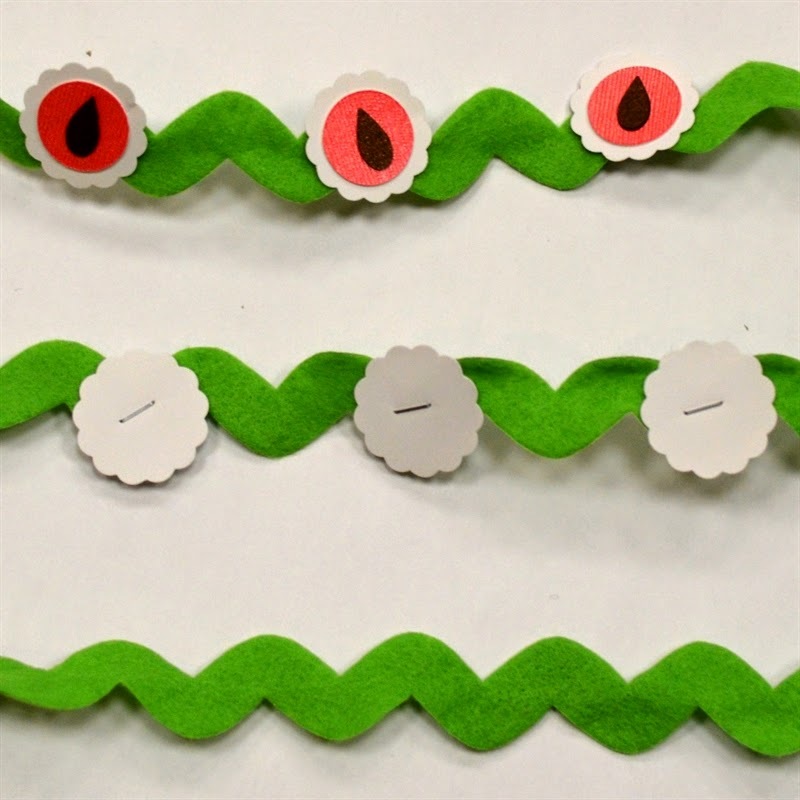 The rick-rack garland is about twelve feet long and is wound in and out of the wreath. I didn't use any tiny lights this year since the elements are all so brightly colored. 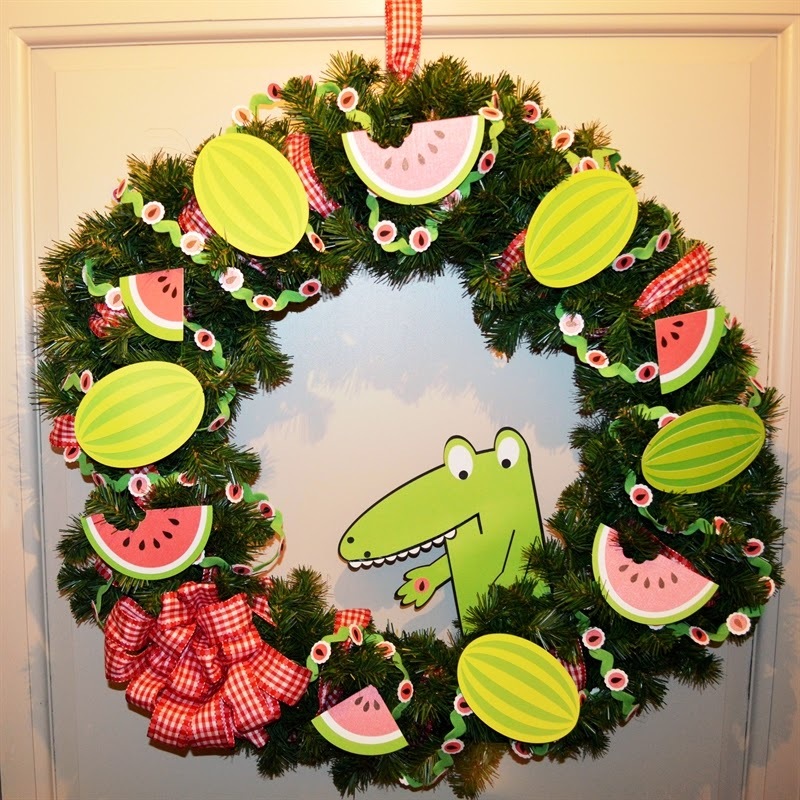 There are a lot of watermelon seeds on this wreath! 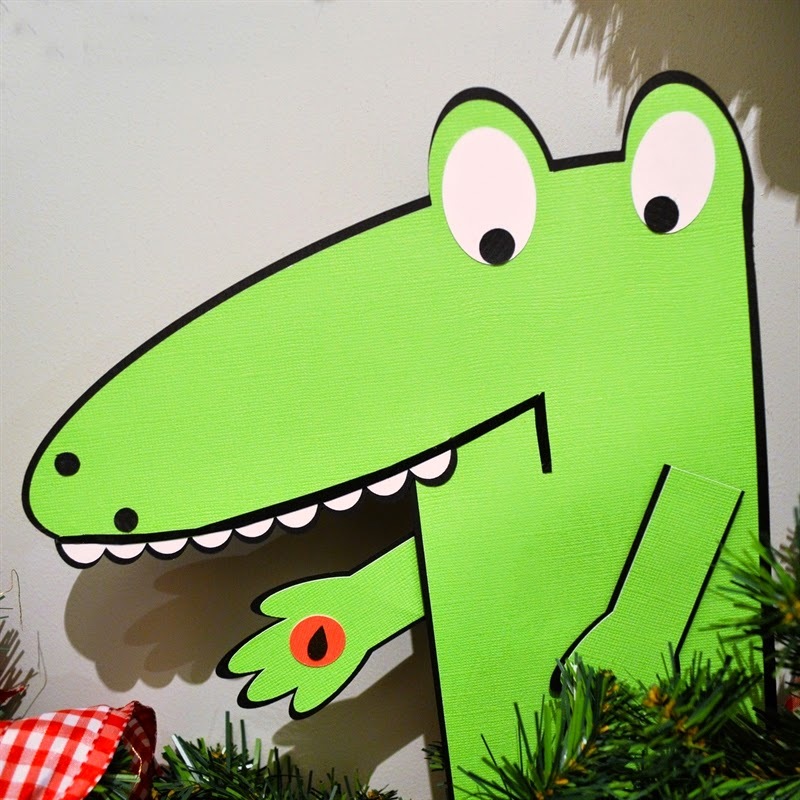 I used Design Space to create a crocodile that looked pretty close to the crocodile in the book. I did this by welding circles, ovals and a few rectangles together. My version is not identical to the illustration in the book but I think you can recognize him! 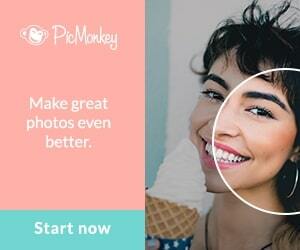 If you look carefully at a picture, you can figure out the basic shapes that go into creating the image. I wasn't able to create a perfect shadow layer in Design Space (I hope that an offset function will eventually be added to the program). I needed the black outline to make him stand out in the center of the wreath. I added another pink circle beneath the seed in his hand to make it a little more noticeable. His teeth are made from a string of small circles welded together. I cut into the main piece of the crocodile to insert the teeth and then added the black line at the bottom of his "lips" with some black washi tape curved along the snout. The wreath is in a tiny hallway between two rooms at the museum so it is very difficult to get far enough away to take a photo! To hide the hanging wire at the top I added a loop of the red and white gingham ribbon. 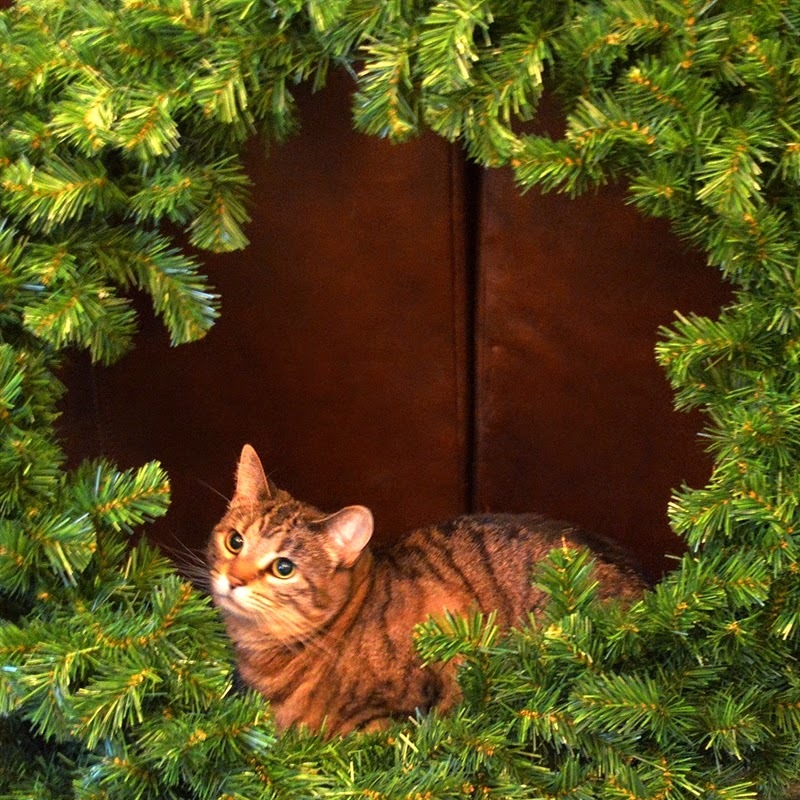 While I was working on the decorations at home, our cat decided that she liked to hang out behind the wreath. She makes a pretty cute decoration too! 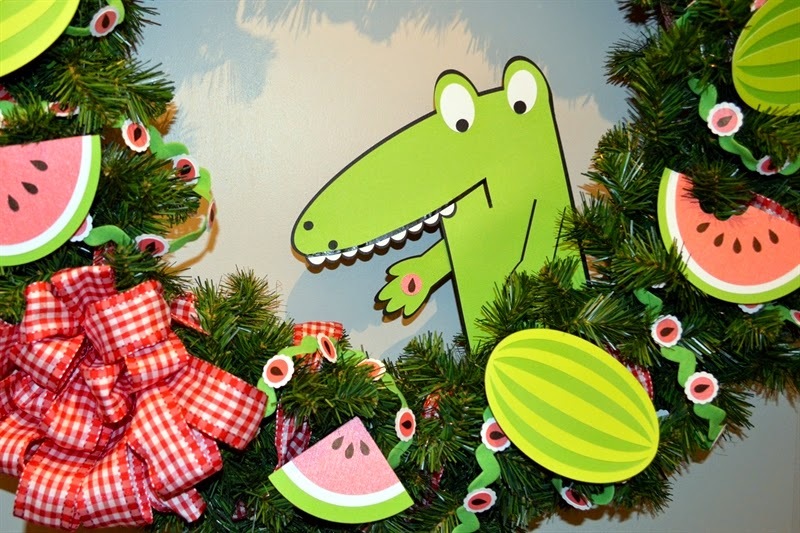 I hope that the families visiting the museum for the Family Trees exhibit enjoy the story of the little crocodile and the watermelon seed. The inspiration books are displayed by each tree (or wreath) and you often see families reading the books as they go through the museum. Have you ever swallowed a watermelon seed? The Concord Museum has a wonderful collection, including Ralph Waldo Emerson's study, Henry David Thoreau's desk from his Walden cabin and the Paul Revere lantern from 1775 ("one if by land and two if by sea..."). You can find the museum website HERE. If you live in this area and have never been to the museum it is well worth a visit and from now until the end of the year you will also be able to see the Family Trees exhibit. 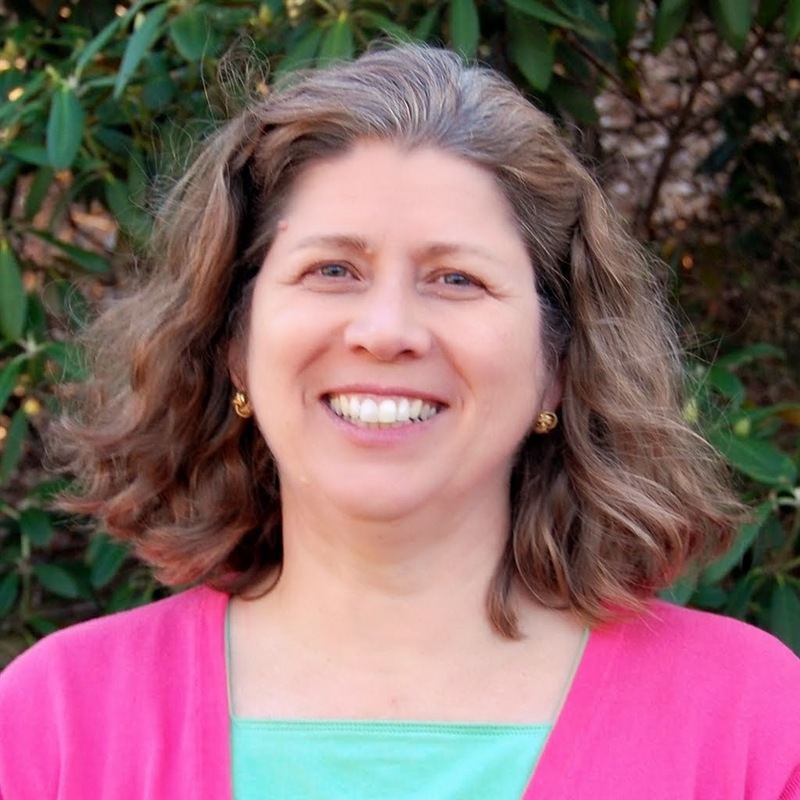 Family Trees is a special event that has been held at the museum for the past eighteen years. Volunteers decorate trees with a children's book as the inspiration. Some of the trees are decorated by the author or illustrator of the book. This event is a fundraiser for the educational initiatives at the museum. You can read more about the Family Trees event HERE. I have started to put up some decorations at home. I was surprised to read that many people put up their Christmas tree right after Thanksgiving. We put up artificial trees in most of our rooms little by little through December but never put the real tree up until just a few days before Christmas. If you put up a tree, when do you do it? Artificial or real? Curious minds want to know! 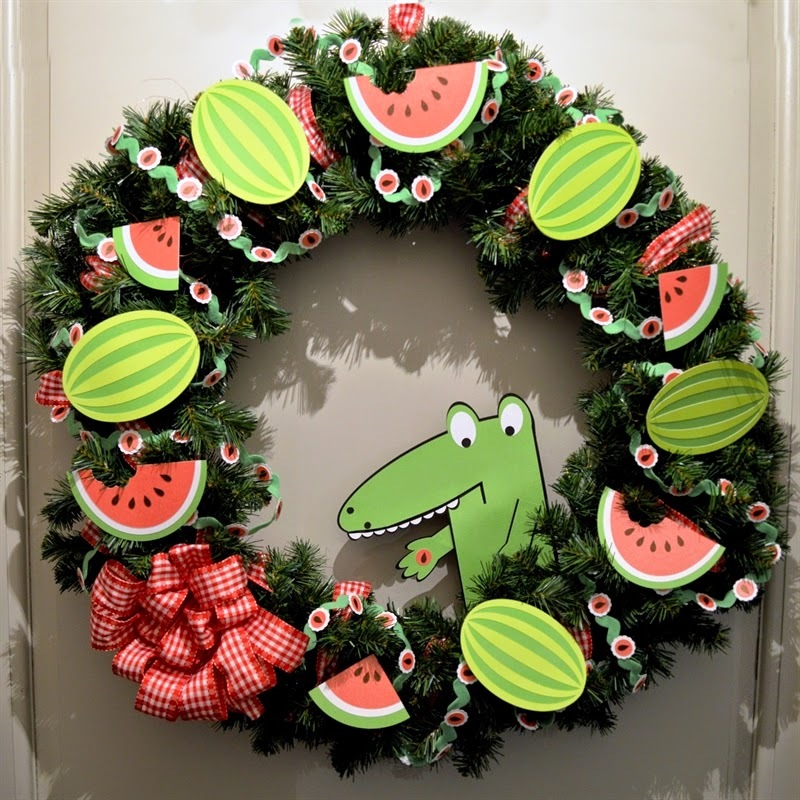 You are always so creative, Diane, and this wreath is no exception. It is so cute and really tells the story. Thanks Bobby! This one was pretty simple and fun to do with the bright colors. I love reading about the wreaths and trees you decorate for Christmas. You are such an inspiration! 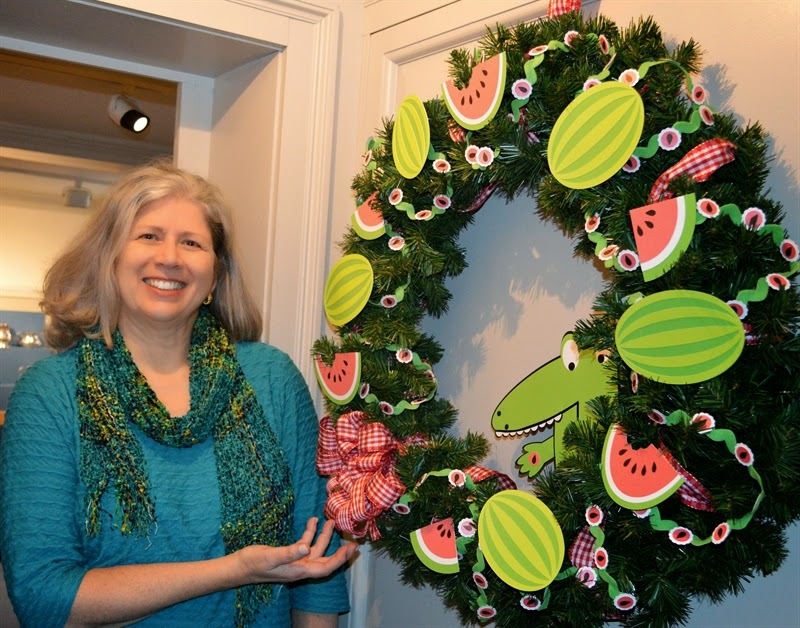 This year's wreath for the museum is so unique. Now I want to buy the book for one of my grandchildren. We have always put up a real tree. We usually purchase it the first weekend in December (this weekend, yay!) and keep it up until after New Year's Day. I have started putting up my other decorations, but I still have a long ways to go! Happy holidays to you and your family. Thanks Cheryl! 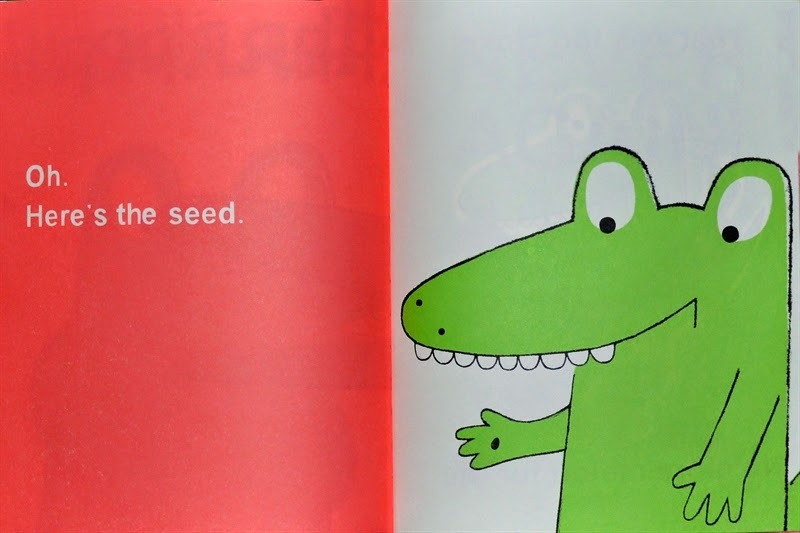 It is a cute book and I loved the way it told the story of the feelings you have if you swallow a seed! I need to get up in the attic and start pulling down more decorations. We have been doing some painting so things are a little behind schedule but there are still 22 days until Christmas (yikes!). Happy Holidays to you and yours. I also enjoy reading your stories with the wreaths you do. 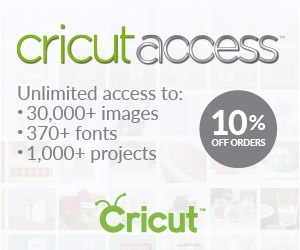 I have been following you for a few years and enjoy all the wreaths you have done. You really come up with great ideas. Thanks Kathy! It's fun to choose a book (or sometimes have one assigned) and then try to figure out how to portray it on a tree or a wreath. 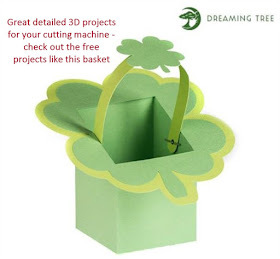 If your family has a favorite book you could try doing a little tree at home too.